The bags are made from stitched leather and there are a range of colours available for the silk velvet cover. 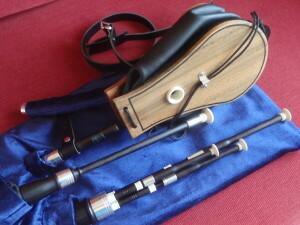 Sets of Northumbrian Pipes are made to order and the price depends on your specification, so please contact me so we can discuss your needs. Most sets come with four drones allowing the set to be played in a range of musical keys. In addition, they can have ‘tuning beads’ to increase this range even further. The four drones can be ‘Standard’ or have more ornate ‘Fully Mounted’ decoration. The metal work is usually Brass but can be Silver plated. End caps can either match the rest of the woodwork or be made from imitation ivory to provide a contrast. Any mounts and tuning beads are made to match or compliment the design. 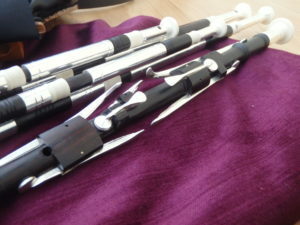 Chanters can be made in a number of different forms. 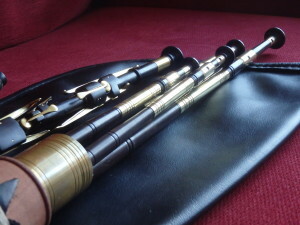 The simplest form is a Keyless Chanter (the original ‘Northumbrian Small Pipe’), and the most popular form is the 7 Key Chanter which allows you to play the majority of tunes within the Northumbrian Pipe repertoire. Additional keys can be added in various combinations up to 17 in total. Sets can be made in a range of musical keys. 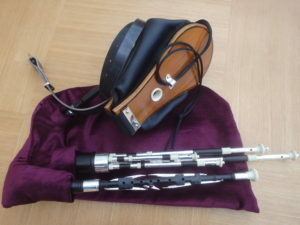 Traditionally, a standard set is made in F or ‘pipers pitch’ F+. Other pitches can be Concert G or D.
Metal work is usually in Brass but this can be Silver plated. 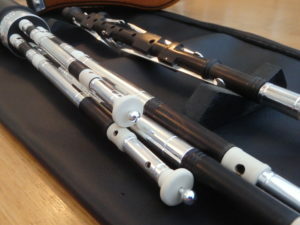 Chanters are made in African Blackwood, and the end cap is usually either Blackwood or Imitation Ivory to match the mounts on the drones. 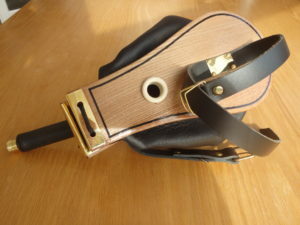 My Bellows are made from leather hand stitched onto curved wooden cheeks. The leather arm strap and friction buckle allows easy adjustment, and the laced hinge allows free and independent movement of each cheek. Fittings can be brass or silver plated with the air inlet fitting made from blackwood or imitation ivory. Waist Belts are leather and sized to fit.